Four years ago, Japanese company DS Audio broke new ground with the world’s only optical phono cartridge, borrowing technology developed and honed in various scientific, industrial and medical applications. The company’s debut model, the DS-001, was only released in its native Japan but the overwhelming response it received soon led to a second model, the DSW1, and to worldwide distribution. Since then, the range has grown with the addition of the flagship DS Master 1 and entry-level DS-002 models. The Master 1 was the first of the company’s designs to feature an advanced optical-mechanical system in which the micro-optic sensor is positioned in closer proximity to the stylus. This improves photo-electrical conversion of the signal and therefore extracts an even more accurate and detailed level of information from the vinyl’s grooves. 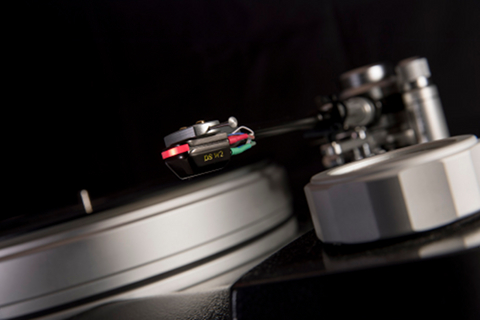 The new DS-W2 incorporates this same approach, as well as the Master 1’s wire-suspended cantilever which is designed to considerably lower the compliance, making the DS-W2 able to perform effortlessly at its best with a much wider range of tonearms (the DS-W1, in contrast, needed to be paired with a low-mass tonearm for peak performance). The DS-W2 sports an aluminum body, a boron cantilever and a Micro Ridge stylus. A handcrafted natural rose quartz LED indicator adds an eye-catching detail. Like both the Master 1 and the DS-002, it delivers an output of 500mV and more than 25dB+ of channel separation. DS Audio recommends a tracking force of 1.7g. In common with all DS Audio optical cartridges, the DS-W2 comes with its own separate, dedicated, phono stage/equalizer. Its power supply features twelve 56,000μF capacitors which are all connected via a 1.5mm thick pure copper-plated busbar. The phono stage/equalizer uses a special shielding that covers the entire transformer, blocking external RF and other environmental interference. A specially printed circuit board promises a short and clean signal path, and there are both RCA single ended and XLR balanced outputs.